Greetings from India. I hope this email finds you well. I also hope it is a comfort to you to know of my own well-being so far from home and the good progress we are making in our efforts here. Today is our sixth day in India. I am traveling with Mitta Wise, our First Medicines Member Services director who is herself a hypnotherapist, energy therapist, and RN. We have been staying in Chennai (Madras), the largest city on the southeastern coast of India. On December 26 the tsunami affected many areas in this region and along the coast to the tip of India and even on the western coast. We have come here, as you may know, to offer assistance with our gentle caring therapies in effort to allay distress, trauma, and grief caused by the loss of life, livelyhood, and property. 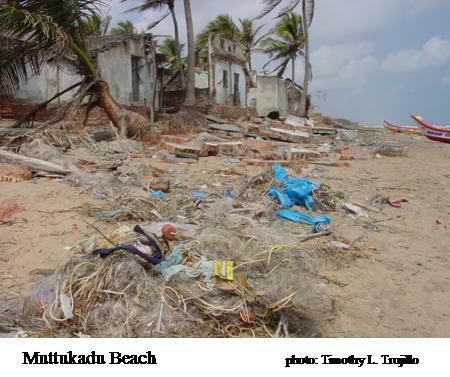 The greatest impact by the tsunami was to poor fishing villages along the coast. They have lost loved ones, their boats and nets, and now due to fear of eating fish, their entire industry is in chaos. The villagers are also living in fear that another tsunami will come and do more harm. We have been working through our guide, interpreter, and now therapeutic assistant, N. Dhamodharan. Dhamu, as is his familiar name, is a twenty six year old gentleman who has just completed his Masters Degree in Computer Arts. 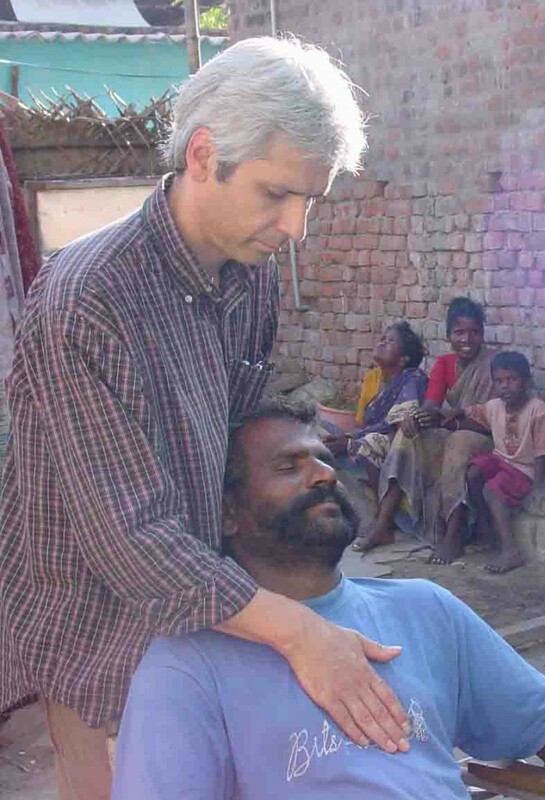 In his village of about 2000 people he is the only person we have met who speaks fluent english, due to his education, a very rare blessing received only through sponsorship by our Liaison in America, Jim Rudolph. The language spoken here is Tamil and the people are of a very dark, near black complexion with thick black hair and brilliant white smiles that beam. Upon arriving in any villager’s home, one of the first experiences is the demonstration of the waterline on the walls where the tsunami flooded their home. This is for homes that are standing, as many of the two-room block houses have been knocked down and the thatched huts washed away. Some of the huts have been rebuilt and some families are simply living under tarps on the site of their destroyed home. 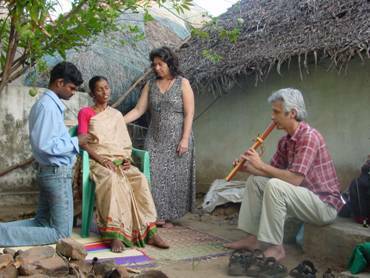 In Dhamu’s village, Srinivasapurum, the villagers remain. 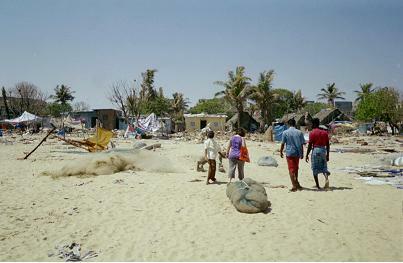 Another village we visited, Muttukadu, has been relocated to a “tent village” away from the threat of another tsunami. The devastation is beyond comprehension. 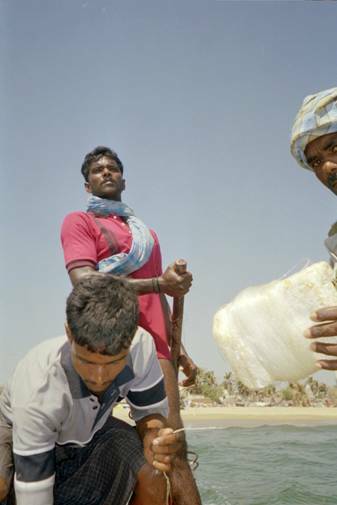 Besides fish, which is now unavailable, the staple food for them is rice. They have been given rice from their government, but we have been told that it is not good for them and hurts their stomachs. In the other village the rice was spoiled by sand and is causing other problems for them. We have already undertaken a campaign to provide more rice. Yesterday we purchased eight 25kg bags of good rice and delivered it to some of the villagers we have been providing treatments to, knowing that food is one of the most critical first medicines. Mitta has sent out a plea for more money to buy rice. We know that ultimately truckloads of rice are needed, but we are doing what we can to comfort those suffering with some good food. When we visited the other village we were also asked to help provide school slates for the young school children. We have purchase some for this village and will deliver them today along with spinning tops for the boys and jump ropes for the girls. Play, too, is a critical need to alleviate suffering and I have already donned my red nose to entertain some of the children and plan to do more. We have been meeting with various individuals to help reduce their physical and emotional suffering. We have developed a method whereby we give massage and hands-on treatments as Dhamu interprets our instructions for relaxation, calm, comfort, release of sorrow and visualization for strength and hope. Dhamu has also assembled a team of friends who facilitate the work and all of them are learning our methods. Yesterday we stepped into a courtyard to provide treatment for a gentleman and a woman. We set up two chairs and Mitta and I began our work as Dhamu guided each in turn through our instructions. Soon other villagers arrived and we found ourselves conducting a full-blown clinic long into the darkness of night. We lost track of how many treatments we provided and sadly had to turn some away with the promise that we would return to offer more help. The high point of the clinic day was when some of the villagers, having observed our method, stepped in to give instruction in their language as we worked. We soon had not only clients, but several assistants. In a spontaneous moment I saw my vision for this mission unfold. Today we will embark on a four-day journey down the coast to conduct the same services at six other villages. We are encouraged by our success yesterday and have seen a model in action that we can now implement in these other sites. This “project” was the idea of Dhamodharan, who has impressed me beyond belief at his compassion, insight and foresight. Please continue to keep me, Mitta, Dhamu and our team, as well as all of the people here affected in your prayers. Pray for our safety and success in this journey. I will give another report upon my return, as well as photos when I can access the technology here to post. Thank you for your support. Each day I am strengthened by the knowledge of all those whose hearts are behind this effort. We have returned to Chennai from our trip to visit other tsunami affected areas to the south. During the fours days we visited six villages and operated clinics at five. Due to internal strife in one community, setting up a clinic was not possible. We began our journey by stopping at the village we had visited the previous week, Muttukadu, to deliver slates for the preschool children and tops and jump ropes for the other boys and girls. We had a grand presentation program under a newly erected tent in which the children sang songs and I played my flute for them. We presented teaching charts for the teachers and slates for the children and they gifted us with drawings that had been done in response to the tsunami. The vivid images of a full blue and wavy background embedded with images of houses and people were very dramatic. The narrative on the back of the drawing I was given detailed the fear and loss of the young boy who had drawn it. I encouraged the teachers to now have the children make drawings of what their lives will be like when they have recovered from this tragedy. We followed up with some children we had given treatments to the previous week, then spent the evening visiting as I taught a small group magic tricks and how to fold origami cranes. We finished the evening meeting the fiancé and “would-be” parents-in-law of Vijay, one of our team members. From there we headed to Mamalapurum for the night. The various visitations and clinics all rang similar, yet unique in the individual flavor of the village and the manner in which the clinics were conducted. In one village we found a nice sandy spot beneath palm trees where mats and chairs were placed as a treatment area. In another we set up the same clinic space of mats and chairs atop the remnants of a house knocked down by the tsunami, piles of rubble, tumbled boats, and the fragments of familiar household debris around us. We offered treatments for consistent complaints of sleeplessness, diffused body aches, headaches, chest wheeze, and the internal and external tremors brought on by the utterance of the word “tsunami.” In one village an 80-year-old man who had been recovered from the rubble and carried to the temple as dead, only to later be revived, sought treatment to help him sleep and return to his favorite spot of solace only a few feet from where we were working on the beach. In this same village, young women brought out a five month old boy to get treatment for his cold. In another village we gathered in a backyard as drums, trumpets, and cannons heralding a funeral for a tsunami victim echoed in the background. The villagers hacked open coconuts for our refreshment. In each village we were welcomed openly and treated with dignity, only later realizing the deeply intimate contact we had we these remote and incredibly beautiful people. We utilized virtually every method in our “bag of tricks.” Hypnotic breathing and relaxation, visualization, massage, hands-on energetics, aromatics, and even a special knotted cord meditation method for recovery, specially adapted by our skilled fishermen team members. We encouraged the drinking of fresh water and recommended further medical care for those cases that merited it; even providing some funds for one villager in dire need to get to the hospital for care. Mitta found a homeopathic pharmacy in Pondicherry and we stocked our kit further with simple remedies to help ease aches and pains and stimulate recovery. We watched with wonder as Dhamodharan went from following our verbal instructions, to crafting the sessions on his own, recognizing which elements of the process were best applied where and when. We encouraged the villagers to learn these methods and practice on one another. The richest of moments came when, watching the light disappear and fleeing from the Cusos (mosquitoes), Dhamodharan gathered a group of about eight women together to teach them the relaxation method and “Stress Management 101”. We returned to Chennai exhausted but exhilarated with the successes we had experienced. Last night we visited the tiny rooftop room that Dhamu’s ten family members sought refuge in for nearly a month before the kindness of their “American friends” made it possible for them to rent a new home. We returned to Dhamu’s village today and set up a clinic on the site of Vijay’s former home on the beach, now a familiar rubble pile. Under a recycled banner tarp held up with crude poles, we practiced the same routine, treating the same complaints. Late in our treatments a woman spoke at length of heartbreak she had been experiencing over time, likely intensified by the community trauma of the tsunami. As we guided her through here relaxation, she began to weep and shake, a condition familiarly reported but not previously observed. We moved here from the chair to the mat so she could be more comfortable. Her mother, daughter, and other family and friends, following our demonstrations, placed hands upon her to comfort her. As we continued to offer her encouragement, a family member reached over and took hold of the woman’s right hand, placing it upon her heart in the practice of self-comfort she had observed in our treatments. Once again I was fill with such gladness, seeing the treatments change hands from ours to the local villagers. Tomorrow morning we attend a wedding, a grand Indian tradition and the first of three I have been invited to during my stay. After the wedding we will conduct another clinic and follow up with those we treated today. On Tuesday, Vijay will take us out on the sea. I have received many words of encouragement and great support for this effort. Thank you for your support. I am sending photos to Lenise and they will be posted on the web soon. Vijay is more like a tree than a mountain. About six foot tall and of steady build, he is not a remarkably large man, but he carries a settled strength and has given me a sense of protection since my arrival in India. He is handsome as can be with rich dark Tamil skin and signature dentures that illuminate his face with his frequent smiles. We celebrated his twenty-fifth birthday together. We gave him a cake and he gave us gifts, a glass globe and a ganesha in a case, some of the very few things that survived the destruction of his home in the tsunami. The flattened rubble pile that was his family home was our first stop when we arrived. The sea also destroyed his family’s boat and shattered their livelihood, like that of so many others in these fishing villages of Tamil Nadu. We launched an appeal for funding for a new boat for Vijay, and celebrated time with his fiancé (would-be) in Muttukadu. He has become like a brother. Vijay was a principle on our outreach team, helping to conduct the searches of the villages for those in need of our help. Along with other team members Baskar and Dessapan, he stood by as we gave treatments, and then disappeared, only to return again with another in need. He was, like the others, both brick and cement for the project. “You must take me out.” I told Vijay. With that a plan was set. Upon our return to Chennai we began to discuss our journey to sea. Vijay spoke with a friend and told us (through Dhamu’s translation) that Tuesday morning was our best time to take out a borrowed boat. We arrived at the village on Tuesday morning with a sense of excitement. What we found there filled us with immeasurable delight. On the beach that had been empty only days before were numerous boats and catamarans, lining the entire beachfront and interspersed with bundles of nets. Fishermen were going through the nets removing fish. An elderly woman approached with a bucket, filled it with fish, and walked back toward the village. There was a sense of elation on the beach as Dhamodharan told us that this was the first day the village fishermen were returning en masse to their work. What had been a gloomy and grey environment seemed filled with life and activity. The boat was checked over by Vijay and his two-man crew. With rope slings they carried the heavy twenty-foot fiberglass boat down to the water, then mounted the diesel motor with its long prop to the back. They watched the wave patterns, catching the higher waves to lift the boat into the sea. Mitta, Dhamu and I, along with our captain Vijay and his crew, headed out to sea upon the Bay of Bengal. We found our places of security in the open boat and settled in for the ride. Mitta and I turned to see Vijay, standing tall upon the back of the boat with his fisherman’s lungi wrapped around his shoulders. This was a different Vijay than I had known. Now he appeared like a mighty king, rudder in his hand like a scepter. With his eyes cast out upon the rolling swells, he guided us on our adventure. His crewmen cast lures into the water and wrapped the nylon line around their legs to troll the sea for catch. We motored out more than ten kilometers, watching the shoreline shrink behind us. From a distance it could have been Santa Monica or any other city by the sea, but the rich blue water was like no other I had seen before. We made a wide loop, each taking turns to stand “fisherman-style” in the boat with a rope rein to keep us secure. I fancied myself as tall and proud as Vijay as I too cast my gaze across the sea. Our journey complete, Vijay turned the boat toward shore. We rode upon the waves to the beach, like a grand surfer. I turned to see that signature smile on his face, happy to had given us an adventure, but happier still to have been to sea, to his place of livelihood. On the beach several of the villagers greeted us. By now Mitta and I had become familiar guests and many of the villagers had become our friends. A small girl, whom two days earlier we had given treatment to overcome her “tsunami fear,” approached Mitta and took her by the hand, guiding her back to the village. She beamed with pride as she escorted her new friend; there was a saunter to their walk as though they had taken similar walks many times before. She escorted us to her house, a small two-room block home on the beach that had been swamped; yet spared during the tsunami, only the emptiness, the waterline, and the fragmented roof bearing the tale. Her mother, whom we had also given treatment to and counseled regarding the challenge of enduring this season of despair, now appeared as a figure of grace. She was dressed well and her hair was fixed quite nicely with curls. She invited us to sit, and then produced the customary “cold drinks” of orange soda. On the other side of the room another woman was cleaning fish and cooking a stew. The house was filled with jubilation as the young mother opened her purse to show us her wages from her first day returning to work at the fish market. We celebrated this renewal of village spirit. Our treatments, we knew, could help calm the broken hearts, but it was the return to the normal activities of life that created true healing. Today is Monday, February 21. I have almost finished my packing, for tonight I will leave this dear India to return home. In the days of follow-ups to our treatments I have visited with many of those I have written about in my reports. To my astonishment, despite the heaviness with which we found them, there have been remarkable outcomes. A single intervention of love from these foreigners, with the aid of the local team, has been a catalyst for recovery. Even the young three-year-old Monica of Muttukadu, who had experienced paralysis of one side of her face, showed me how she can now close the eye on that side. The regular medical therapies and hands-on treatments of her parents are inducing a wondrous recovery. I came with hope; I leave with confidence. On Thursday I will give a talk at the University of Judaism in Los Angeles about this trip and the general mission of First Medicines. If you are in the LA area, please come be a part of this special event. Email me for details and I will send out the address info later. Please continue your prayers and financial support for the victims of this tsunami disaster. As you can see, the recovery is just beginning. Our support must endure.